The Death of Socrates (French: La Mort de Socrate) is a 1787 oil on canvas painting by the French painter Jacques-Louis David. It shows the death of Greek philosopher Socrates. He was sentenced to die by drinking hemlock. He was sentenced to die because his ideas were against those of Athens. It was also for corrupting the minds of the youth. The painting also shows both Crito and Plato. Crito is sitting sadly at the edge of the bed. Plato is holding the knee of Socrates. Socrates had the choice to go into exile or be sentenced to death by drinking hemlock. Socrates chose death. In this painting, a red-robed disciple hands a confident Socrates the goblet of hemlock. Socrates' hand pointing to the heavens is his love of the gods and fearless attitude to his death. This painting is currently at the Metropolitan Museum of Art in New York. 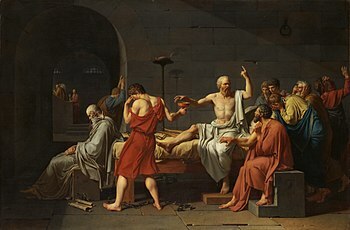 Wikimedia Commons has media related to The Death of Socrates (Jacques-Louis David). This page was last changed on 19 January 2018, at 21:09.